I Guess You Could Call This a Rant…? Posted in Inspiration, Quotes	by A.K. I am a woman of dreams. They live inside me, they follow along with me, and they define me. Sure, some of my dreams are a little bit ‘out there’, but that doesn’t mean I can’t dream. I have dreams of living in New York City, and I shouldn’t let anyone tear me down. Thus enters those who I like to call, the ‘dream crushers’. Chances are, I have considered almost everyone I ever met to be this person at some point. Because yes, I try to share my crazy big dreams. They aren’t impossible though, they are aspirations, goals, something to look forward to or to motivate me. 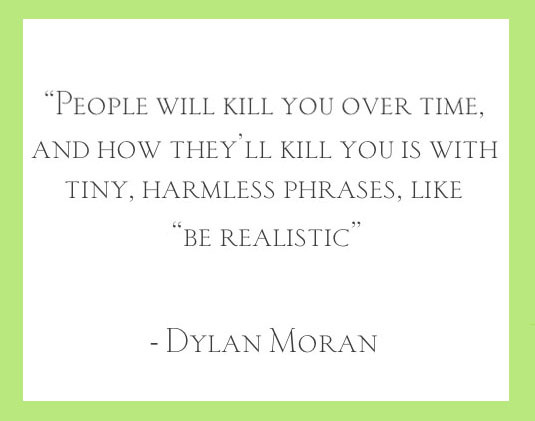 Okay, so maybe I’m going on a little bit of a rant right now… I just despise it when someone tells me to ‘be more realistic’, like in the above quote from Dylan Moran. Anyone has the freedom to dream and to look up to the sky and know that there is hope (cheesy much?). I mean, we live in a free country with freedom of speech. I’m sure there’s also freedom of think.